In my mini club, we are making vendor carts - it's a kit from Laser Creations. (www.lasercreationsminiatures.com). Here is my finished cart. Now I have to decide whether I am going to actually GLUE Christmas items to the cart. What a great club project! I love how you have kept it pretty neutral so the goodies will shine! The nice thing about gluing is that it keeps things as a permanent display that can be enjoyed again and again with minimal fussing. Also, if you decide to do a different Christmas themed project at some point, you'll have to buy more minis! Darn! Yes, that's exactly why I painted it white. And yes, that's why I am thinking about glueing -- also because I am clumsy and if I am able to get some goodies on those shelves, I don't want them to fall off or for me to knock them off when adding other things. I feel like I keep knocking things over whenever I try to make a scene! 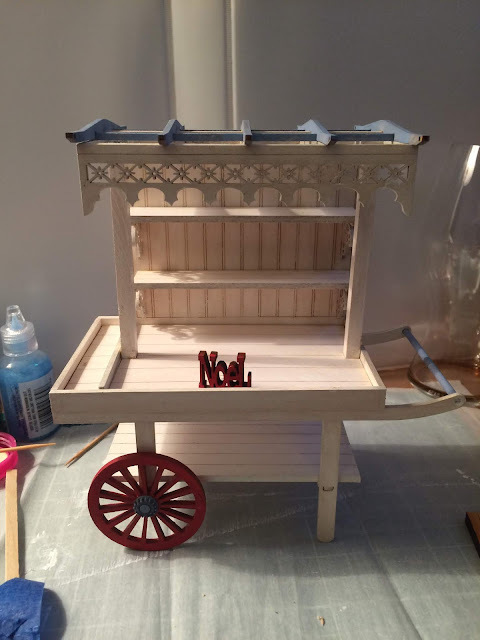 Gluing is such a FINAL commitment isn't it, however while you are pondering what merchandise to permanently affix, it gives us an opportunity to Fully Admire your Beautifully made empty Christmas cart! YES, and I have such a hard time with that for minis! BUT it will also be nice for things to STAY in place when I play with the cart. Thank you for the compliment on my cart. Merry Christmas! Lol! I'm excited to go through my mini stash and figure out what to put on it!